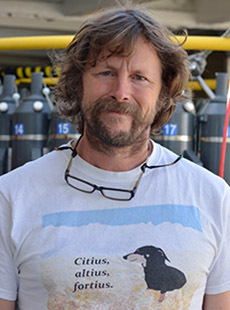 Tony D’Aoust has been working on the R/V Atlantic Explorer since 2014. He is a senior marine technician providing assistance for moorings cruises, instrumentation, mentoring junior techs and other specialized tasking. Tony’s involvement at BIOS is through the UNOLS Tech Pool. He is one of the original marine technicians in the tech pool and brings with him over thirty years of research vessel experience from the Arctic to the Antarctic. When not working on the Atlantic Explorer Tony captains his own commercial vessel in Alaska, fishing for salmon with his two sons or moonlights as a small boat operator for remote video productions. While not a full time employee of BIOS, Tony provides contracted support to the operations of BIOS's research vessel.